Director – Robert Markowitz, Teleplay – Sherman Yellen, Based on the Novel by Gaston Leroux, Producer – Robert Halmi, Photography – Larry Pizer, Music – Ralph Burns, Special Effects Supervisor – Janos Kukoricza, Makeup Effects – Stan Winston. Production Company – Robert Halmi, Inc. In turn of the century Budapest, Sandor Korvin, the conductor at the Magyar Kiralyi Operahaz, coaches his new wife Elena to take the role of the female lead Marguerite in a production of ‘Faust’. Because Elena will not submit to the opera house owner Baron Hunyadi’s desire to have her, the Baron conspires to ruin her debut, having people boo in the midst of the performance and paying critic Oskar Kraus to write a scathing review. Elena is so distraught that she throws herself to her death in The Danube. Sandor goes to kill Kraus but is badly burned in the effort. He then takes refuge in the catacombs beneath the opera house, hiding his hideously burned face behind a mask. Four years later and Baron Hunyadi is backing another production of ‘Faust’ under English conductor Michael Hartnell and starring the temperamental diva Brigida Bianchi. Hartnell gives the American singer Maria Gianelli the job of Brigida’s understudy. When Korvin sees the striking resemblance between Maria and his late wife, he determines that she must be the star of ‘Faust’ and takes her away for private tuition. However, when Hartnell develops romantic interest in Maria and Hunyadi tries to have his lecherous way with her, Korvin prepares to kill to keep the woman he sees as his love. The Phantom of the Opera (1909) was originally a novel by Gaston Leroux and has been filmed numerous times. The classic film version was The Phantom of the Opera (1925) with Lon Chaney [Sr], which still remains the best version of the story to date. There were two subsequent versions prior to this mini-series adaptation – the Universal colour remake Phantom of the Opera (1943) with Claude Rains and The Phantom of the Opera (1962), the Hammer version with Michael Gough. (A full list of all other film versions is at the bottom of the page). This version came just before the point that the story of the Phantom was turning from a horror tale to a romantic weepy, courtesy of Andrew Lloyd Webber musical, which premiered in 1986. The mini-series was a production from Robert Halmi, who later formed Hallmark Productions and produced a number of adaptations of classic stories for the Hallmark Channel. Of all the filmed versions of The Phantom of the Opera to date, this is the most variant telling. For no clear reason, the film changes the names of all the principal characters. It also adds a long preamble to tell a Phantom origin story – in this case, showing him to be a composer whose wife is driven to suicide and how his face is burned when he tries to obtain revenge on those responsible. 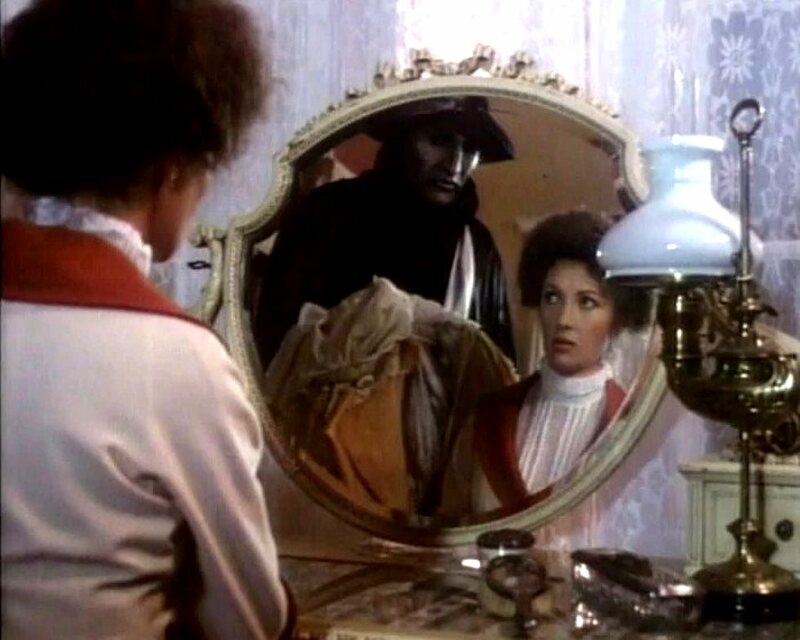 The Phantom’s wife (a character that does not exist in any other version) is also a double for the mini-series’ equivalent of Christine Daae, thus bolstering the reasons for The Phantom’s fixation on her. The character of Christine’s paramour Raoul de Chagny here becomes Michael York’s conductor. There is also the new character of Jeremy Kemp’s opera owner who tries to have his ways with all the divas. (Somewhat amusingly, the mini-series names the villain Baron Hunyadi, seemingly unaware that Hunyadi is actually the name of the Hungarian royal family). The mini-series also rearranges the events of the story somewhat – the venture into the catacombs to rescue Christine/Maria happens in the middle, not at the climax; Carlotta/Brigida doesn’t exit or be killed early on (and her fate is never specified); while the climax of the show is the falling of the chandelier and possible killing of The Phantom and Brigida rather than the venture down into the Phantom’s lair. For some reason, the story has also been relocated from Paris to Budapest. (Perhaps the reason for this might simply have been that Budapest was a cheaper location to shoot). One of the great pluses of this version is the casting of Jane Seymour. Jane Seymour is one of the most elegant and classiest ladies in the film industry. Here she has a regal beauty that shines through even when she is reduced to grime and tatters. 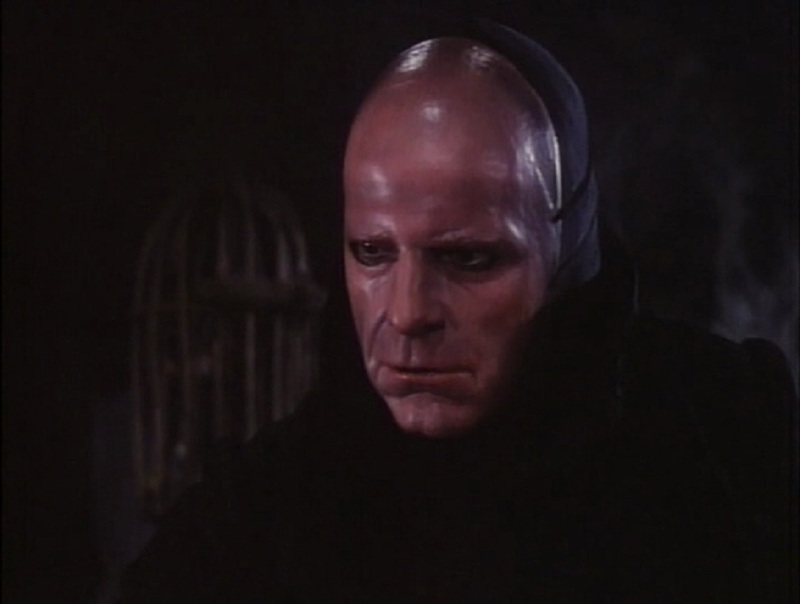 Maximilian Schell is probably too bland an actor to be a truly effective Phantom. The Phantom’s papier-mache mask looks spooky and his burned face suitably hideous, while he is appropriately kept to the shadows for the most part; on the other hand, the flesh-toned mask that The Phantom wears for much of the show looks rather absurd. Director Robert Markowitz does a reasonable job of generating atmosphere during all the skulking around. The beautiful Budapest locations add much in the way of period atmosphere. There is also a wonderful classical score. On the minus side, Robert Markowitz and the script misconstrue the drama. Christine/Maria gives herself to the Phantom’s tutelage far too early in the game. This, their trust, her firing, her becoming Michael York’s girlfriend and Carlotta’s being harassed are told in montage rather than drama. Being such essential character turning points, these should have been given far more time than they get. Other versions of The Phantom of the Opera are:– The Phantom of the Opera (1925), the finest version of all starring Lon Chaney; Phantom of the Opera (1943) starring Claude Rains; The Phantom of the Opera (1962), the Hammer version starring Herbert Lom; The Phantom of the Opera (1989), a slasher film starring Robert Englund, which involved time travel and had The Phantom selling his soul to The Devil; The Phantom of the Opera (1990), a tv mini-series starring Charles Dance; The Phantom of the Opera (1998) from Italian director Dario Argento starring Julian Sands; and The Phantom of the Opera (2004) from the Lloyd Webber musical starring Gerard Butler. Other variations on the story are The Phantom of the Paradise (1974), a satirical version that sets the story to rock music; a pornographic version Phantom (1998); Angel of Music (2008) about a modern reporter conducting an investigation into the truth of the story; Phantom of the Theatre (2016), a Chinese version that conducts some radically different takes on the story; and modernisations like The Phantom of Hollywood (tv movie, 1974), The Phantom of the Ritz (1988), Phantom of the Mall: Eric’s Revenge (1989) and a Disney Channel children’s tv movie The Phantom of the Megaplex (2000), which had the Phantom haunting respectively a movie studio, a movie theatre, a mall and a cinema multiplex, as well as the low-budget The Phantom of the Opera (2014) where the Phantom’s spirit is disturbed by a reality tv crew.